Jaguar XJ tuning and Jaguar XJ ECU remapping Viezu and our global network of dealers are proud to provide Jaguar XJ tuning and Jaguar XJ ECU Remapping. Jaguar epitomises technological innovation, and such an exuberant, lavish and respected brand demands the paramount in ecu remapping technologies and engine tuning, in which, Viezu embodies. It must be acknowledged that when it comes to Jaguar XJ tuning Viezu are the world leaders. Our dedicated team of ecu remap software technical specialists build all of our Jaguar XJ tuning maps in-house. We've worked extremely hard to obtain our high standard of Jaguar XJ tuning knowledge and expertise by heavily investing in research and development of Jaguar XJ ecu remapping, and by honing our skills with hours of research and development with Jaguar XJ dyno runs on our Mustang dynamometer rolling road. 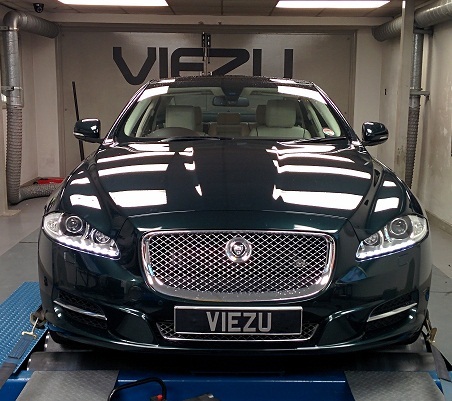 You can see Viezu'ss full list of Jaguar tuning here: Jaguar Tuning Viezu always put our Jaguar XJ customer's needs first and our tuning can be customised to ensure we meet your requirements. If you're after an increase in throttle response and performance from your Jaguar XJ tuning, our prestigious Jaguar XJ performance tuning will seriously improve the drivability of your Jaguar XJ. Or if you have fuel economy in mind, then Viezu's BlueOptimize Jaguar XJ economy tuning is for you.